Hello! When I first started this card, I didn't realize how many "B" items where would be until I tried to think of a title for the post (I know, I'm not too creative there!) I could add bricks to the "Bike and bunnies." This was a fun card to make - I love creating scene with my dies. I started with embossing a white card stock cut with Spellbinders A2 Matting Basics A. I ran it through with a brick wall embossing folder by Paper Studios. I sponged the edges very lightly with Distress Ink Pumice Stone. Next came the twine and the matted circle with a quote from Sweet n Sassy God is stamped and embossed with black detail embossing powder. Because of the twine in the back, I added some small Joy! foam pads to the circle adhere it. My favorite part was die-cutting the Memory Box Brand New Bicycle out of silver foil (any backside of the SB Precious Metals Craft Foil will be silver) and coloring it with Copic markers. I added a bit of glossy accents to the seat to give it some extra shine and padding. I filled the basket with some tiny flowers from a punch and used the ice white Viva Decor Pearl Pen for the centers. 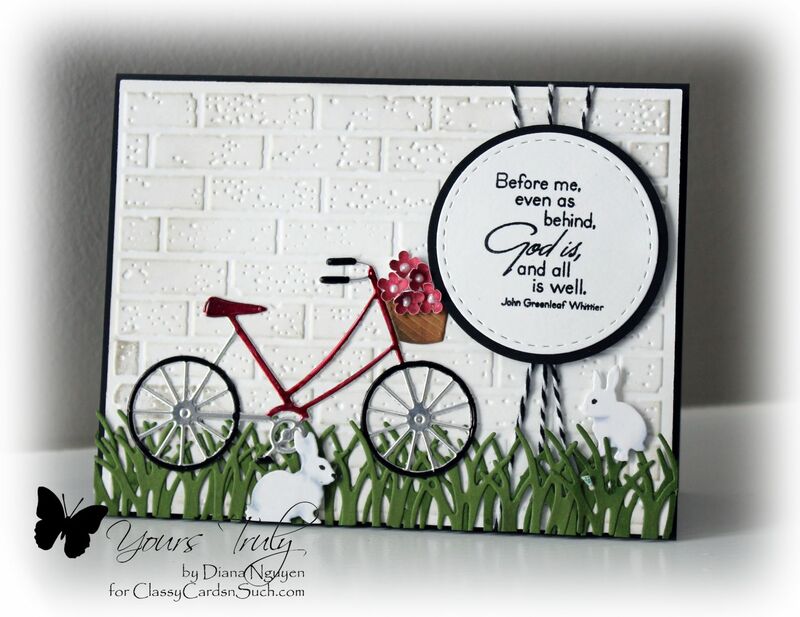 To anchor my bicycle, I added grass and a couple of bunnies using Impression Obsession Grass Border die and the Springtime Bunnies dies. I love this one -- totally unique for you but very sweet. Like the scene. This is truly wonderful, Diane! I love the embossed background and the awesome die-cuts with a heartfelt sentiment. Awesome! What a blessing it is for us that you joined our Challenge last week. This week, our Challenge is still ongoing so, please stop by again and join us at Word Art Wednesday! Leaving you the blessing found in God's Word from Hosea 10:12 which says, "Sow righteousness for yourselves, reap the fruit of unfailing love, and break up your unplowed ground; for it is time to seek the LORD, until he comes and showers his righteousness on you." Hugs, always!